I was driving down Route 9 South from Northern Jersey. Upon reaching the junction, I was supposed to make a left onto 88 but accidentally made a right off 9 onto First Street. One block in, I stumbled across an awesome Castle! Address: 111 Forest Street. Forest Castle was built 1900 and is not only a Castle, but more of a "Medieval Grounds" where you'll find not one but TWO Castles! Located on the corner of Forest St. and First St. , the area predates the avenue itself. Forest Castle is now an "apartment building" inside (I wish I lived there), and the other smaller Castle (419 First Street) is a "real estate agent". 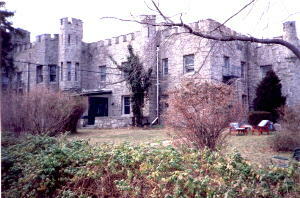 Forest Castle in Lakewood New Jersey was actually originally called Lynx Hall. It was built by Jasper Lynch a prominate real estate investor and amateur golf champion. "Lynx Hall was located on Forest Avenue and First Street. It was built by Jasper and Rachel Lynch. Jasper Lynch made his fortune in real estate and was an established golfer and a charter member of the Ocean County Hunt and Country Club. Rachel Lynch was a prominent figure in the Lakewood Society for the prevention of Cruelty to Animals. She hosted extravagant fund-raisers, concerts, and recitals at Lynx Hall to benefit her crusade against cruelty to animals. I just stumbled upon your website and I think it is terrific. I'm not sure you are aware that Forest Castle in Lakewood, New Jersey is going to be demolished to make way for low income apartments... such a shame. I am more of a lighthouse lover but castles are growing on me quickly. Jim. I used to live in Forest Castle in 1971 – 1972. My ex and I rented a one bedroom apt inside the castle for $140 a month. It was a neat and wonderful place to live. Thanks to Robert W. Harney for the picture.